￼￼￼Antonio Fantuzzi da Trento (1510–1550), after Parmigianino (1503–1540), The Virgin, Christ Child, and St. John, Italians, ca. 1540/50, Chiaroscuro woodcut on wove paper, 7-3/8" x 9-1/4", The Anna C. Hoyt Collection, Vanderbilt University Fine Arts Gallery. Nearly a millennium after its origination in fifth-century Chinese textiles, the woodcut became a popular medium in Europe, thanks to the prevalence of paper manufacturing in late-fourteenth-century France and Germany. The medium has continued to resonate in print practices globally, with artists still creating woodcuts today. Then & Now: Five Centuries of Woodcuts spotlights prints from Vanderbilt’s collections, surveying the wide range of woodcuts created over 500 years and across many cultures. Beginning with Michael Wolgemut’s Presentation of Jesus in the Temple, ca. 1491, the exhibition continues its survey through sixteenth-century examples by the master of the medium Albrecht Dürer, a student of Wolgemut, as well as works by other prominent German artists including Lucas Cranach the Elder, Hans Baldung Grien, and Albrecht Altdorfer. 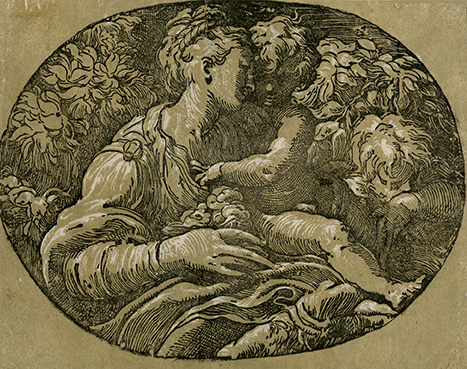 Spotlighting printmaking practices outside of Germany are fine chiaroscuro woodcuts by Ugo da Carpi, one of the first practitioners of this early form of color printmaking, and Antonio Fantuzzi da Trento, as well as an example by Netherlandish artist Paulus Moreelse. Also on view is a recently conserved seventeenth-century woodcut, Hercules Overcoming Envy, by Christoffel Jegher after a design by Peter Paul Rubens—often considered to be one of the most important works in the history of printmaking. The nineteenth century is represented by The Works of Geoffrey Chaucer, a rare, large-scale volume printed in 1896 by William Morris, with engraved illustrations by Edward Burne-Jones, on loan from Vanderbilt’s Jean and Alexander Heard Libraries, Special Collections and University Archives. Moving into the twentieth century, a suite of powerful woodcuts created by World War I veteran and artist Conrad Felixmüller in 1918 and a work from 1923 by Gerhard Marcks help illuminate the medium’s more recent revival at the hands of prominent German Expressionists, who were directly inspired by medieval woodcuts. A print by Dadaist Hans Arp is included among those on view, along with works by other twentieth-century artists such as the Americans Fritz Eichenberg and Sidney Chafetz. (The latter two are recent gifts that will be shown for the first time at the gallery.) Two prints from a portfolio created by contemporary American artist Jay Bolotin, as source material for what may be the first animated woodcut film, are also on view, along with the film itself. Additional twenty-first-century prints, by the German artist Christiane Baumgartner and the Korean-born artist Koo Kyung Sook, bring the exhibition into the present, illustrating the medium’s arresting potential and persistent place in contemporary art. Beginning February 11, a concurrent presentation of works in Gallery 2 curated by Vanderbilt University Fine Arts Gallery Intern Echo Sun (art and psychology major, Class of 2020), focuses on Japanese woodblock prints from the nineteenth and twentieth centuries. This display of work reveals the enduring influence of traditional ukiyo-e (pictures of the “floating world”) prints, while highlighting examples of more contemporary, artist-driven expressions of the form. This companion presentation to Then & Now: Five Centuries of Woodcuts includes editions by Katsushika Hokusai, Utagawa Hiroshige, Tsukioka Yoshitoshi, Kiyoshi Saito, and Takahashi Hiroaki (Shotei), among other Japanese artists working in the woodblock print medium over these two centuries. Then & Now: Five Centuries of Woodcuts is on view January 10–March 1, 2019. Opening Reception: Thursday January 10, 5:00–7:00 p.m.